The company was originally formed in 1975 to construct farm buildings and roads. Because of the downturn in farming we needed to diversify to stay alive. We began block paving, tarmac, kerbing and road works. Bristol based Cementation Piling remarked that our "supply and service was excellent, there was never any hesitation". Mowlem's used us to supply 1300m3 of concrete for sea defenses at Seahouses and 1000m3 for a sewage treatment plant at Belford. 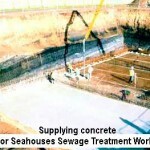 We have also supplied 4500m3 of concrete for Seahouses sewage treatment plant. 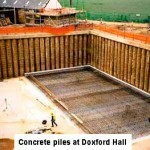 We have supplied 4000m3 of concrete for a 25 bedroom country house hotel at Doxford Hall. Now a major employer in north Northumberland we are proud of the excellent service we believe that we offer to our customers. The service is excellent, we have never had it so good. What started out as a sideline has become Birdsall's main revenue stream. Once their customers have experienced the service provided by the friendly family firm and compared that to the rather indifferent attitude of many of their larger suppliers, they seldom look back. What started out as a sideline has become Birdsall’s main revenue stream. Once their customers have experienced the service provided by the friendly family firm and compared that to the rather indifferent attitude of many of their larger suppliers, they seldom look back. PMK Civil Engineering Ltd would like to thank Gilbert Birdshall for their ongoing help in undertaking the Penmanshiel and Quixwood Windfarm Project. On behalf of PMK, I Colin Kelly site manager of the aforementioned project have nothing but praise for your companies quality and standards which have never dropped. Having almost 30 years experience in this industry myself I have never known a company to deliver concrete to these short notice time scales. A special thanks to Stevie at the plant in Belfort whom I've only ever spoke to over the phone for being so accommodating to some early and late deliveries again at short notice, also to the drivers who have negotiated there way through some tight spots and obscure locations along the 32km route but have always been professional and courteous to the residents nearby and other drivers. So far so good,again thanks.